Somewhere in the late 1500's or so, Southernwood was introduced to the British. 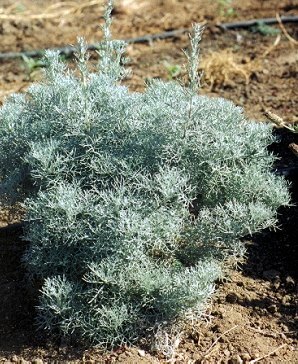 Because it was native to Southern Europe and, because the British were already familiar with their native Wormwood, it became the southern Wormwood. Eventually, this was shortened to just Southernwood. Lads were already including the pungent Wormwood in bouquets to lovely lassies, no doubt to mask less-than-desirable personal odors, so it was no surprise that they began to include the pungent, and clean-smelling Southernwood also. Consequently, two common names for this Artemesia are Lad's Love and Maiden's Ruin. The French, who have wonderful names for everything, have called Southernwood Garderobe (closet), referring to its reputation to guard your robes from moths. This pungent aroma makes it difficult to perceive of Southernwood as a culinary herb, but it has been used as such in the past. Reputed to have been used with fatty meats, the result must have been extremely bitter (no doubt the reason its use was discontinued). There are records that indicate the Shakers were dealing with Southernwood as a medicinal herb as early as 1830. It was reported for use in obstructions and in treating children for threadworms. Today, Southernwood is most appreciated for its contribution to the landscape both for its soft sea-green appearance and for its fragrance, which is a woodsy citrus smell. Flowering is rare and, when it does occur, it is like those of most Artemisias: disappointing. The flowers are small yellow buttons that turn a most disagreeable brownish cream. Fortunately, shearing the plants to between 18 inches and two feet produces not only sturdy growth, but eliminates the odd flower stalk. Southernwood leaves keep their fragrance when dried which makes them a good choice for adding to sachets or potpourri. Artemisias are truly amazing. They take many different forms from ground covers to large shrubs and run the gamut of colored foliage from silvery shades like those of Powis Castle Artemisia and Silver Southernwood to soft vibrant greens like those of African Wormwood and Southernwood. Silver Southernwood (pictured on the right) is a very soft silver that shines in the garden and nicely complements the sea green of Southernwood. It is also very fragrant, but there is no record of it being used for medicinal purposes. This plant is sometimes available in plug trays. These trays hold 128 of all the same plant. They are a great low cost way to fill a lot of space. Each cell is 3/4 of inch by an inch. Check here to see if Southernwood or Silver Southernwood Plug Trays are available. 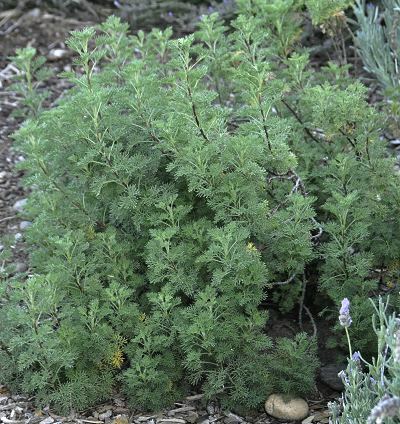 Silver Southernwood is one of the six plants chosen to be in our Zone 5-11 Fragrant Herb Garden Six Pack and both Southernwoods make great additions to our Zone 8-11 Fragrant Herb Garden Six Pack.